While virtual reality is more often than not a way to showcase new gaming experiences, many still hold the technology can have a greater impact by transporting us into someone else's shoes. At least, that's how HTC sees it, as the company behind the HTC Vive virtual reality headset has announced three grant recipients that will premiere as part of its VR For Impact initiative. 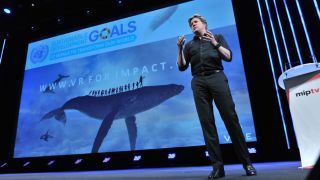 The three projects were chosen for their role in VR For Impact's goal of using virtual reality technology to increase awareness for the United Nations Sustainable Development Goals program, which promotes the necessary steps for a peaceful and prosperous world. The first of the three grant-approved projects is Tree, a virtual reality experience combining a 360-degree film with haptic feedback to tell the tale of deforestation and its negative impact on the environment. The second project is SpaceVR, a virtual reality platform allowing users to take in 4K resolution VR footage of space firsthand, courtesy of the Overview 1 — the world's first VR-enabled satellite, planned to launch later this year in partnership with commercial space travel startup, SpaceX. Last but not least is Honey Bee, a guided VR tour promoted by ice cream company Häagen-Dazs that informs viewers of the flying insect's importance in the ecosystem. It also outlines the struggles we can expect to face as bee populations continue dwindling. All three projects will be unveiled in time to celebrate Earth Day this year, which falls on Saturday, April 22. Each of HTC's VR For Impact-funded projects will be available for download on HTC's Viveport storefront. While not the usual zombie-shooting and spaceship-piloting fare normally associated with virtual reality, VR For Impact's planet-conscious projects could offer a nice change of pace for those who own a Vive this weekend.